Note: As of August 20, 2017 we verified via the Truly Ergonomic website that this keyboard is not out of stock and not for sale. For users looking to repair a broken model or replace an old model, we recommend a keyboard in our Best Ergonomic Keyboards Guide. 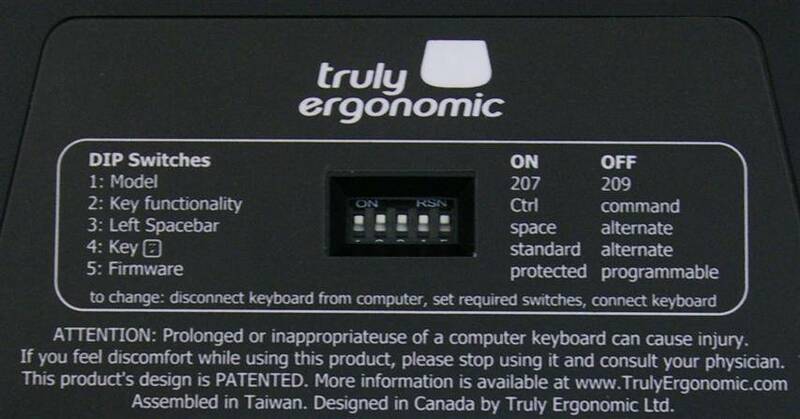 With a name like “Truly Ergonomic,” this keyboard won’t win any awards for modesty. Neither is it likely to win “Fastest product to market,” with initial production delayed so long that it almost became a byword for vaporware. But this extravagantly-named keyboard just might win an award for, well, ergonomics…. The Truly Ergonomic Keyboard in my preferred operating position with the palm rest removed. In general, computer keyboards are way too wide for proper ergonomic mouse placement. This fact is reflected in the narrow width of most serious ergonomic designs, including the Goldtouch and Freestyle. None, however, has squeezed down the layout with this degree of elegance. Much thought, research, and testing went into the Truly Ergonomic layout, and it shows. The most important keys are not only easy to reach, they’re also more intelligently placed – and in some cases larger – than those on a standard keyboard. In a move reminiscent of the Typematrix, five frequently-used “edge” keys are shifted to the middle of the board. These keys are Enter, Backspace, Tab, Delete, and the Windows Logo key (called the “Superkey” here as it does different things on Mac and Linux). This center column arrangement makes these important keys easier to find – and easier to press using the strong thumbs and forefingers. The Truly Ergonomic layout incorporates a number of significant and interesting key changes. The Shift keys have also been moved to superior spots. On the right side, Shift now occupies the space vacated by Enter and the Apostrophe key. On the left, Shift replaces Caps Lock, which has been moved to a minor station near the Function row. Looking at the Truly Ergonomic design, it’s easy to see the input of developers. Most alternate keyboard layouts consign the cursor controls – Home, End, PgUp, PgDn, and the arrows – to Siberia, and most users neither notice nor care. 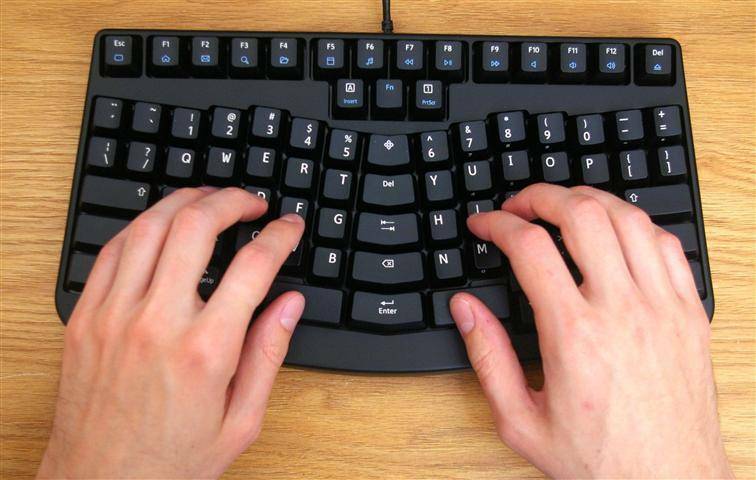 Developers, however, recognize the importance of these keys for text editing efficiency, and the Truly Ergonomic keyboard finally gives them their due. The cursor controls are arranged in two groups, shaped like plus signs and given places of honor right next to the spacebar on each side. What about the adjustment period? Ctrl for Shift and vice versa, with both hands, ad nauseam, adinfuriatam, ad bang-head-on-keyboardam. Backspace instead of B, producing a void. Shift instead of Apostrophe, producing nothing. Right hand positioned one notch to the left of the home keys, producing a royal mess. 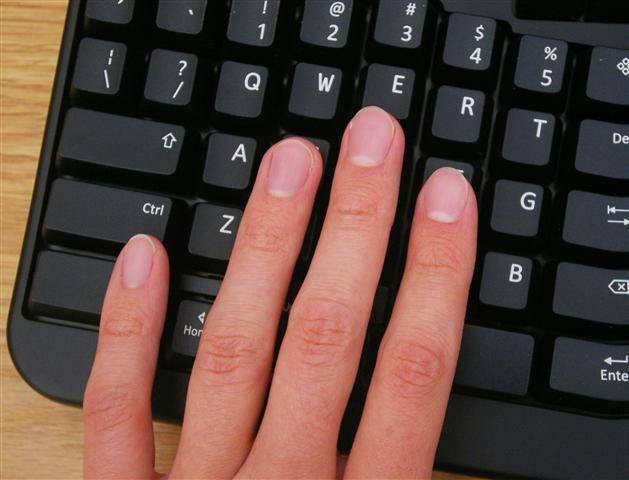 These mistakes diminished with time – but so did my ability to type competently on conventional keyboards. If this proves true in your case, you may find yourself toting the TE wherever you go. Fortunately, that option is made practical by its small size. The TE DIP switches are easily toggled with a small screwdriver. For Asian layouts, on the 209 model only. On the 207, this toggles the middle Delete key with a neutral code that you can remap at the OS level. Changes OS mode from Windows/Linux to Mac. Switches the left side of the spacebar to a neutral code that can be remapped at the OS level. 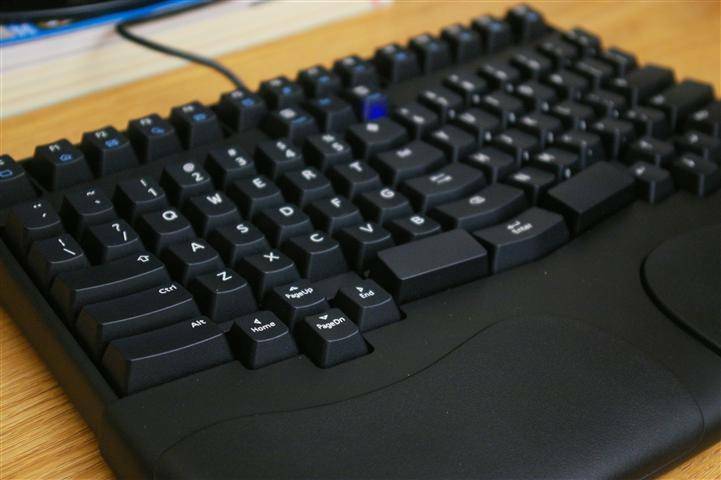 You could use this to put Backspace under your left thumb, like the Kinesis Advantage. Makes the top-left key into an additional Tab for the 207 – great for Alt-Tab, which is a challenge on the default layout. Also used for Asian layouts on the 209. Wait a minute, firmware programming? Yup. You won’t find this promoted in the Truly Ergonomic advertising, but it turns out that the firmware is programmable. Before you keyboard hackers get too excited, though, this requires special software that doesn’t even exist yet. It is supposed to be under development, and I hope it materializes. Being able to remap the keys at the hardware level would be a dream come true for many enthusiasts. Anyway, Truly Ergonomic has good reason to brag about their gold-plated Cherry MX key switches. In the hands of a competent typist, this keyboard absolutely sings. Mechanical switches also have great longevity, and should last through more typing than you’re likely to do during the rest of your life. The typewriter was invented around the time of the American Civil War. Since then, much has changed about what happens when you press a key on your keyboard. Very little has changed, however, about that keyboard itself. The key rows are still straight across – not curved to match your fingers – and the columns are out of alignment with each other. This arrangement was created to accommodate mechanical arms, and it persists because a change would mean readjustment for billions of users. The curved key rows match the natural shape of your hand better than standard straight rows. Check out the picture of the left, which shows how the key rows of the TE match my fingers with natural precision. Now compare your own hand to the keyboard in front of you. Those straight rows clearly weren’t designed with human fingers in mind. The curved arrangement may take a bit of getting used to, but it is much more comfortable once you do. Grid layout – keys in straight columns – is a less tangible benefit, and is actually annoying at first because the keys aren’t where you expect to find them. Some people believe that the grid arrangement makes typing easier in the long term. I haven’t experienced this myself, but objectively, the grid arrangement just seems to make a lot more sense. As a rule, I don’t use palm rests. This rule was made, not by me, but by a committee of the middle and forefingers on my right hand. Some time ago, they voted unanimously to start tingling like mad anytime I might exhibit a tendency to rest my palm on something while typing. People with less independently-minded fingers, however, may enjoy using the TE palm rest. I said “kinda” padded above because this palm rest is not the squishy pillow you might be imagining. It doesn’t really even feel like foam or gel at all, but rather some sort of plastic-coated material that has roughly as much “give” as a well-inflated bike tire. Still, it feels comfortable enough to me, and at least it is not offensively scratchy like I find some Kinesis palm rests to be. In contrast to the plastic tabs of some other designs, the Truly Ergonomic holds its palm rest like it means to keep it. No less than nine – count ’em, nine – stout screws must be undone for the keyboard and palm rest to part company. While this actually presented a small inconvenience for me, I consider it a high-quality touch, and a great benefit for those who plan to carry the TE in a laptop bag. Like most keyboards, the TE dual-purposes its function keys as media controllers and auxiliaries. Unlike most keyboards, however, it does this in a way that is intuitive and can actually be done with just one hand. The Freestyle and even the Goldtouch insist on putting the Fn key way down in a corner, virtually requiring two hands in order to use it. 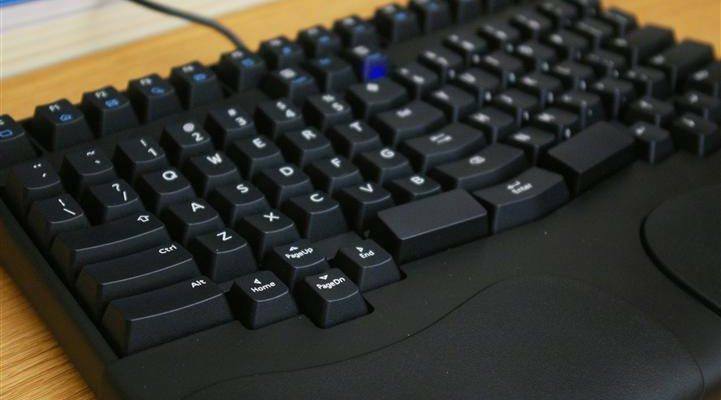 The Truly Ergonomic locates this modifier key in the middle, just below the top key row, where most combinations can be one-handed, provided you have a reasonable reach. So simple, yet such a difference. I can think of several leading ergonomic manufacturers who might have a differing view on that statement – for example, Microsoft, Kinesis, Keyovation, and Safetype. This debate about wrist pronation and RSI is for learned ergonomists, which I am not. I can only say from personal experience that I need the tent feature on my Kinesis Freestyle – without it, my thumbs hurt. Like everything in ergonomics, it boils down to what works for you. While there is no tent, tilt, or adjustable splay on the TE, its key caps are angled to make typing easier. The TE lacks any facility for adjusting the slight angle between the two hands, a useful feature found on both the Goldtouch and the Kinesis Freestyle. You’re stuck with the factory default, which is set to a compromise position for non-touch-typists. It will probably work for you, but if it doesn’t, your only recourse is the money-back guarantee. While I don’t agree with the self-superlatives used in TE marketing – (“The Truly Ergonomic Keyboard is properly designed, and therefore different from other keyboards…”) – I do believe there is much to be said for this design. It combines a small footprint, an innovative layout, and mechanical keys into a high-quality package with a detachable palm rest. At $229 as of this writing, it is not the least expensive keyboard on the market – but it’s not the most expensive either, beating the Kinesis Advantage by a handy $40 on retail. Best of all, there is a 60-day return policy, so the Truly Ergonomic keyboard is at least truly guaranteed. Disclosure: This review was made with a temporary review sample from Truly Ergonomic, which I returned to the company afterwards.